TRENTO, Italy, Dec. 2, 2010 — Throughout Trentino, Italy, many signs have been left by the dinosaur giants that trod the beaches and dominated the landscape millions of years ago, even before the valleys were formed. Icnologists – scientists who study the traces of animal behavior – have long been trying to discover more about the types of animals that once roamed the earth. “There are very few other places in the world that offer similar opportunities to see continuous sequences of rocky formations containing such large numbers of perfectly dated fossils. The mountains of Trentino allow us to observe the appearance and disappearance of entire groups of vertebrates, and to correlate these events with the geography and climate of their eras. The idea of permanently collecting these fossils virtually in a huge digital archive was a fascinating challenge and is now a real possibility,” said Marco Avanzini, the curator of the geology department at the Museo Tridentino di Scienze Naturali, or the Tridentine Natural History Museum. Analyzing footprints to understand what these large animals looked like is more difficult than it sounds. The conventional methods of evaluating paleontology findings are based on visual analysis of the footprint itself and on manual measurement of its depth, to determine the weight and characteristics of the animal. The number and shape of the prints allow scientists to determine whether the animal was alone or in a herd, whether it was a carnivore or an herbivore, its posture and many other factors. Icnologists also make casts using transparent plastic, resin or plaster, which are subsequently analyzed in the laboratory. However, these invasive and imprecise techniques are likely to damage the actual fossil, which has already been worn by the passage of time. A 3-D laser scanner image of a dinosaur footprint. But academics are still trying to find an effective way to discover the secrets concealed in dinosaur footprints. Coming to their aid are new 3-D technologies developed by the FBK Trento research center. These noninvasive and extremely precise methods, based on photogrammetry and 3-D laser scanning, offer documentation of fossils that is more accurate than previous methods. 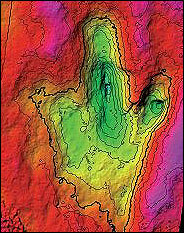 Continuing a collaborative relationship that began a number of years ago, the researchers Fabio Remondino, Giorgio Agugiaro, Alessandro Rizzi and Stefano Girardi of the 3-D Optical Metrology (3DOM) research unit of the Fondazione Bruno Kessler in Trento worked with the geologists of the Tridentino Museum of Natural History (MTSN) to complete the 3-D recording and digital archiving of numerous dinosaur footprints and tracks. Most recently discovered by the MTSN geologists are three dinosaur footprints, which were found last summer as natural casts in the ceiling of a tunnel excavated during World War I. The location was Monte Buso, on the Pasubio limestone massif at the border of the provinces of Trento and Vicenza. This finding could change the Jurassic geography of Italy. “There are not supposed to be any dinosaurs in this area of the mountain and in strata from this era. In the models envisaged by experts to date, during the lower Jurassic, Trentino consisted of mud flats which were largely submerged and distant from any continent – an environment in which large dinosaurs clearly could not have lived. It is now apparent, however, that if there are large dinosaur footprints at Monte Buso (those found belong to examples weighing 300 to 400 kg and measuring 6 to 7 meters in length), then these mud flats could not have been that far from stable continents,” explained Avanzini. So, along with the picks and brushes of the paleontologists, the FBK researchers took their own 3-D surveying tools to the site – computers, digital cameras and two 3-D laser scanners: a time-of-flight scanner and a triangulation-based system. These latter instruments can achieve resolution to a tenth of a millimeter. 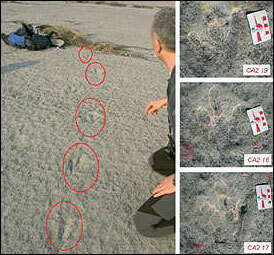 A dinosaur track in the Coste Dell' Anglone site (approximately 30 footprints) and closer views of three numbered tracks. Through experiments and tests conducted in the field, the researchers developed a method that yielded fascinating results, producing reconstructions of the dinosaur footprints in a digital rather than physical format. Through specific software, the prints left by dinosaurs can now be viewed on a computer monitor. This allows researchers to analyze the images quickly and from any angle, rotating them in space, turning them upside down, or zooming in and out, all of which can be done with such precision as to reveal details that would be invisible to the naked eye. The acquisition process also allows researchers to study the actual site where the prints were found – whether in a tunnel, a cave or outdoors – and to reproduce it faithfully in 3-D. These new tools therefore offer significant support for conventional measurement methods. “Our collaboration with FBK began almost six years ago with the discovery, near Caserta, of the oldest human footprints in Europe, dating to approximately 360,000 years ago. The potential of the 3-D surveying methods being developed by the 3DOM unit at that time seemed perfect for revealing the morphology of footprints, on the basis of which the humans responsible for them, and how these humans walked, could be reconstructed. This collaboration was then continued in projects to acquire dinosaur footprints and prehistoric reptile prints in general in many other locations in Italy,” Avanzini said. One certainty, however, is that the collaboration between the FBK 3DOM research unit and MTSN has resulted in the 3-D acquisition of numerous prints: in Trentino, at the Coste dell’Anglone site (Dro), at Monte Finonchio (Rovereto), at Castello di S. Gottardo (Mezzocorona), at Zone (Brescia) and at Monte Pelmetto (Belluno), while many casts already held by the MTSN have also been scanned. In the future, the FBK researchers will be working at Lavini di Marco (Rovereto) to survey in 3-D the entire area – a significant site with more than 1500 prints. It is clear, therefore, that the production of 3-D models based on archaeological data is an extremely useful tool for paleontological researches, as illustrated by the case of the Trentino region. The footprints left behind by the giants of the past are part of the artistic and cultural heritage of Italy. 1. The sector of the Earth's surface registered upon a remote sensing device in a satellite. 2. The amount of space occupied by a component on the surface upon which it is mounted. 3. The space on an optical component occupied by a light beam. In image processing, the study of structure or form of objects in an image. (TOF) The length of time needed for a signal to arrive at and be reflected from the target. The basis of an active autoranging/autofocus system.